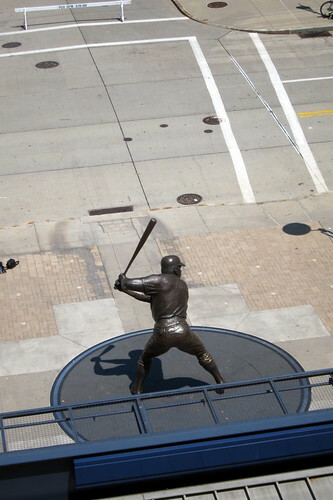 This statue of Willie Stargell, designed by sculptor Susan Wagner, was dedicated outside PNC Park’s left-field entrance on April 7, 2001. The 12-foot, bronze statue of the slugging left fielder and first baseman was unveiled just two days before the Hall of Famer’s death. Wilver Dornell "Willie" Stargell (1940 –2001), nicknamed "Pops", played his entire 21-year baseball career, from 1962 to 1982, with the Pittsburgh Pirates. Over that time, he batted .282, with 2,232 hits, 423 doubles, 475 home runs and 1540 RBI’s, helping his team capture six National League East division titles, two National League pennants and two World Series (1971, 1979). He was a 7-time All-Star selection, the 1979 National League MVP, and had his #8 jersey retired by the Pittsburgh Pirates in 1982. Willie Stargell was unducted into the Baseball Hall of Fame in 1988. This entry was posted on September 14, 2011 at 1:43 am and is filed under NL East. You can follow any responses to this entry through the RSS 2.0 feed.